Supports KSP 1.1+ on 64-bit Windows and 32/ 64-bit Linux. XInput is not available on Linux. Windows 7 and up. Windows XP is not supported. The mod adds a new button to the mod toolbar. Click the game controller icon or press Shift + L during flight to bring up AFBW's main configuration screen. After setting up your controller you should save your game (by using quick-save or exiting to space center), which will automatically save your controller configuration as well. 2. Copy the contents of the archive inside KSP's root folder. You should see the game controller icon during flight mode. 3. Please note that XInputInterface.dll and SDL2.dll must be in the same folder as the KSP executable and not in GameData. 3. Copy the contents of the archive inside KSP's root folder. Report bugs in GitHub's issue tracker or as a reply to this post. Why do i have a feeling that this looks a lot like AltInput? Only difference is that this one has more configuration options. "Edit your control setup at any time during flight, no need to go back to the main menu to change bindings." Oh my gosh! Where has this been all of my life!?! Thread is back up, hooray Thanks to the mods for fixing it. 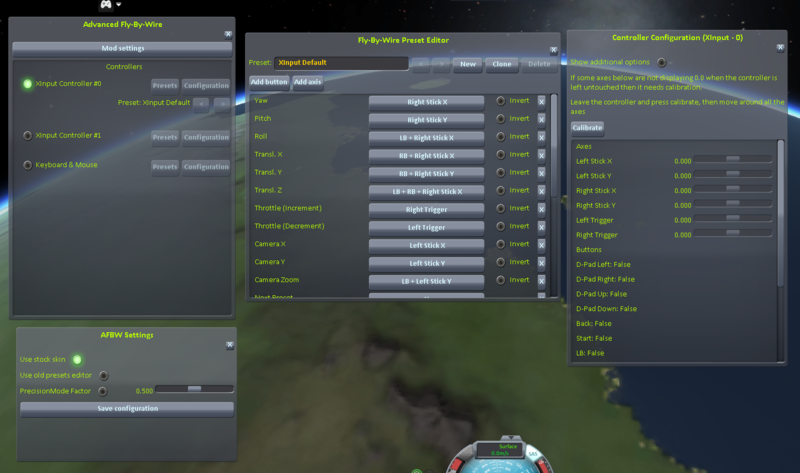 Not working foe me still purple icon on toolbar & blank setting, I have XBOX360 controller & 32bit KSP & 32bit Advanced Fly-by-wire, this mod bug? I have messaged you in private with the info you need to send me so I can diagnose this issue. EDIT: I have also updated the main post with the neccessary steps to submit a good bug report. This mod is an obvious improvement to the AltInput mod in conception, but unfortunately is not functioning in some key ways for me. The bugs are present immediately when running the mod, just running it is the reproduction step. It's a quite a little list of problems, so bear with me. I appreciate your work on this mod. My slider throttle, recognized as "axis 3," registers from 0.0 to 1.0, or 0.0 to -1.0 when inverted, and when set as the throttle will only change it from 50% thrust to 100%, and it won't consistently go below that. If I lower the throttle with the keyboard, my slider seems to have a close to full range, but doesn't consistently go down to the lowest point in the range. The FAR dynamic control adjustment doesn't seem to apply to a controller using this mod, I set it as low as 10 (meaning matching the dynamic pressure of turn while moving at 10 m/s at sea level, I think) and it had no impact on control. These issues do not exist for me when using the AltInput mod, just for your information. The slider throttle was weird too, I think, but it allows for adjustment of individual axises, so I figured out a setting fix. Also, neither mod seems to detect my POV hat axises, but KSP does alright with those. Finally, the trim settings, (which are not bindable in AltInput) are a big part of why I wanted to try this mod, as setting trim with a joystick would be great. They seem to register alright, but just not "stick." With RPM and other mods, you can have a trim indicator separate from the regular pitch/roll/yaw indicators, so it is pretty clear that it is in fact changing the trim, but when I let off the stick, it the trim re-centers. I have tried the trouble shooting tips listed after "Hold on!" I have managed to reproduce all of the above issues and they will be fixed in the next build. - Breaks the configuration XML, you will need to recreate your presets. This is certainly not a demand for support as I am very appreciative for your work. In fact I want to say thanks again for this great addition to the community. Kerbal players are lucky to have such robust support from modders like you. However, the hat-axises appear to be being misidentified. Sorry, this was due to my own misinterpretation of SDL's documentation, should be fixed now. In fact I want to say thanks again for this great addition to the community. Kerbal players are lucky to have such robust support from modders like you. I just wanted to confirm that the hat axises are fixed. Thanks again. I have posted a poll on what future developments should contain. Click here to vote. It stopped to recognize my joystick. I even re-installed the mod again, but it doesn't show my joystick on the list. The stick works fine, even the joystick buttons, that are bind to controls in options menu work. "Have you trid turning it on and off again?" I have. It worked. Sorry for your time. I'm really excited about this mod. As a Linux user, I hope the Linux port is coming soon. First off, I want to say that it's great that this mod exists, and I can't wait to explore it's potential. Having said that, I'm in a bit of a bind in that I have a Saitek X55 Rhino stick and throttle, and all drivers are installed and the device is recognized in Windows, but it does not show up at all in game. Additionally I have tried all of the troubleshooting steps listed in the first post, but still no dice. Thanks for the reply to my post, but I managed to get it working by using this mod by itself in a vanilla 0.24 install. Obviously one of my many other mods was interfering. I am not sure which, and with the release of 0.25, that problem is essentially moot. I'm sorry to hear you're having issues. Could you follow the steps in the "Bug reports" section of the main post and send me the neccessary info so I can fix this. and restart the game. Try plugging your joystick once you're actually in flight mode and see if it appears on the list then.